When you are faced with a problem that you can't fix, you need to call in the experts. That's where we come in. Our company has been around for many years and we now know our way around the entire garage setup. Let our professional repair services provide you with the best, properly working door for your garage. Many do-it-yourselfers want to save up on money and do repairs themselves. This is highly discouraged with anything related to springs because doing so might result in grave physical injuries. When you have a broken spring, let us handle it. Do not risk your safety. We have the right training to be able to handle spring replacement safely. We service torsion and extension springs and have in our inventory available replacements for both. Your door's panels not only keep your car safe but they also maintain the curb appeal of your home. For those who are particular about the look of their door, a dent or a scratch may already be reason enough to call in for repairs. For those who are concerned with safety, more extensive damage may prompt them to call. Whether you are the former or the latter, you can call our company anytime for professional repairs. We replace door panel sections with compatible or same brand panels that improve both the look and security of your door. Malfunctioning openers make up a great bulk of the customers for garage door repair. This is because when an opener breaks or malfunctions, the function of the door is altered drastically. Affected garages may have doors that no longer open. When you're affected by this problem, then call our expert team of technicians now. We can service openers whether the cause of the malfunction is electronic or mechanical. We can perform both minor and major repairs. For units that fail catastrophically, we have readily available replacement parts for same day service. 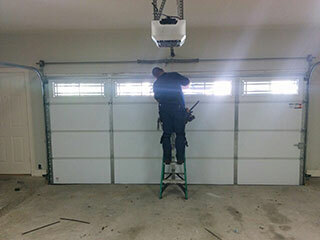 Repairing doors and openers in your garage is our forte here at Garage Door Repair Apopka. Call us anytime you have trouble with your entire garage setup. We'll be happy to help.